The first time we visited Pirca we noticed the peach trees growing in different parts of the village. They were not well cared for and not planted in areas well suited for fruit production. In a conversation with Javier we determined that the village could be benefited by finding a place where a peach orchard could be planted. Javier took me on a hike about 20 minutes across the mountain, away from the village to show me an area where there was natural spring water coming out of a pipe. We looked at the area and determined we could clear, terrace and plant an orchard. Only one problem. The deer would eat the young trees. 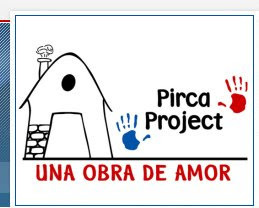 This was the genesis of our next project in Pirca and we had two volunteer families ready to take on the job. Jerry and Tani with their son Brad and wife Ashley were ready to go and they would be joined by Perry and Susan and their three daughters and Perry's sister. Rounding out the contingent was my daughter Judy (chooty as the kids in Pirca refer to her) who would be making her second visit to Pirca. The plan was to teach the people how to build the fence during three days of hard work. We had to coordinate to make sure the ground was cleared prior to the arrival of the work group. Javier worked with villagers to get ground cleared and holes for fence posts dug in advance. Once the area was cleared Jerry, Perry and Brad helped set posts and install the wire. 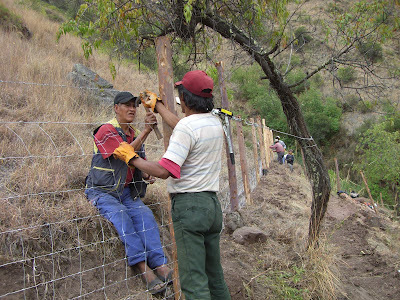 With the training they received Hermogenes and Angelino and others were able to complete the fence. To build a holding tank we needed to bring up sand from the river bed to mix with the concrete. It's time for the trees and irrigation. We bought 90 plus trees in Cusco. There were two different varieties. The people worked hard to get all the materials including trees to the orchard. This will hopefully make a big difference in the way they grow peaches in the future.